The announcement that the Nicaraguan government has granted a concession to the Chinese company HK Nicaragua Development (HKND) to build an inter-oceanic canal has caused controversy and discussion in all areas of Nicaraguan society, and to date there are more questions than answers. The President of Nicaragua, Daniel Ortega, signed the law granting the concession – the law of the Statute of the Great Inter-oceanic Canal, or Law 800 [es] – on June 14, 2013, sparking discussion in the country's blogging and Twitter community. Some users have shown their support for this initiative, but most of the reactions on the internet were of discontent. The programme De Humo TV prepared a report on the subject, explaining what the canal project consists of and the environmental impact it could have on the country. Although the law for the construction of the canal has been passed, feasibility studies have not yet been conducted, and environmental impact studies on effects of the construction are pending. Como todos los nicaragüenses, quisiera que el canal por Nicaragua sea factible, porque sería una palanca poderosa para impulsar el desarrollo del país, pero no son pocas las razones que cuestionan la realidad del anuncio. En primer lugar, su factibilidad. El propio asesor ambientalista de Ortega, y principal científico nicaragüense, Jaime Incer, salió al paso del anuncio de Ortega diciendo: “Un estudio medianamente serio, descartaría su posibilidad”. Like all Nicaraguans, I would like to believe that a canal through Nicaragua is feasible because it would be a powerful lever for promoting the country’s development, but there are many reasons to question the validity of the announcement. Firstly, its feasibility. Ortega’s environmental assessor, and principal Nicaraguan scientific advisor, Jaime Incer, deviated from Ortega’s announcement saying: “a reasonably serious study should rule out the possibility”. Segundo: El daño medioambiental será indudable, todo proyecto tiene esa carga, están los derivados de la mera construcción como el despale de reservas de la biosfera, de la destrucción de zonas de reproducción de fauna como es el caso de las tortugas marinas que además se encuentra en peligro de extinción, de la reconducción de agua dulce para la funcionalidad del canal mismo que puede dar lugar a desecación de cuencas hídricas agredidas por el proyecto. Luego, el peligro a largo plazo es la contaminación irreparable de nuestras cuencas por vertidos de sustancias nocivas, como los hidrocarburos, en especial de ese inmenso patrimonio que es el lago Cocibolca; sin menospreciar el nocivo efecto que tendrían los sonares en la fauna del gran lago. Artículo 97.- Es responsabilidad del Estado con la participación de los Gobiernos Municipales, Asociaciones de Municipios, Sector Privado, Organizaciones No Gubernamentales y población en general, la protección, conservación y destino de las aguas del Gran Lago de Nicaragua o Cocibolca. Secondly: Environmental damage will be unavoidable, every project has its burden, there are by-products of construction like clear-cutting of reserves of the biosphere, the destruction of wildlife breeding areas, for example of sea turtles that are also in danger of extinction, of the renewal of fresh water for the functionality of the same canal that can result in drying of water catchment areas harmed by the project. Next, the long-term danger of irreparable contamination of our waterways, especially of the immense heritage area of Lake Cociboca, by dumping harmful substances such as hydrocarbons, not forgetting the harmful effect sonar would have on great lake’s wildlife. Article 97 – The protection, conservation and destination of the waters of the great Lake of Nicaragua or Cocibolca is the responsibility of the state with the participation of municipal governments and associations, the private sector, non-governmental organizations and the general population. 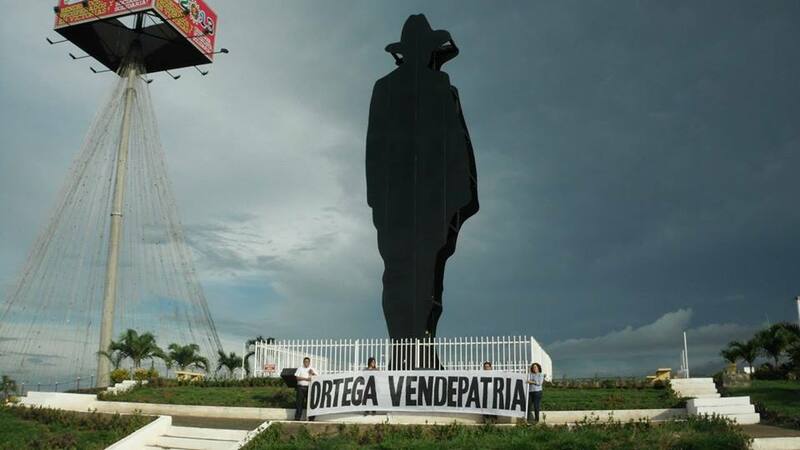 “Ortega – Seller of Our Heritage” Photo shared by Mildred Largaespada on Facebook. El grupo HKND, responsable del proyecto del canal (por cuya licencia pagarán solo U$100 millones de dólares a Nicaragua por una concesión de hasta 100 años) estrenó sitio web. Ahí podemos conocer a su vocero: Ronald Maclean-Abaroa. ¿Si este es el vocero, qué podemos esperar de sus jefes en HKND con licencia para cambiar la ley? HKND, which is responsible for the canal group project (whose license will pay only US $100 million to Nicaragua for a grant of up to 100 years) premiered its website. There we can meet its spokesman: Ronald Maclean-Abaroa [es]. If this is the spokesman, what can be expected of their bosses in HKND licensed to change the law? Hashtags #canalnica [es] and #canalinteroceanico [es] are being used to comment on the project on Twitter. Azucena Castillo (@azulchena)) [es] shared a video of the “March in defense of National Sovereignty and Nicaraguan dignity”. The video [es] from YouTube user Nicarao Libertario [es], shows images of the march that took place on June 13 against the project. Geográficamente, este canal tiene mucho sentido. Sólo son 12 millas del Pacífico hacia el lago de Nicaragua, y posteriormente de ahí se conecta al Atlántico. Pero aún se desconoce si esa será la ruta que tendrá el Canal. Para Nicaragua, este mega-proyecto tiene mucho sentido. La construcción doblará el Producto Interno Bruto per cápita de la nación, siendo el año pasado, 3,300 dólares al año. Pero [¿]porque [sic] construir un Canal, cuando ya existe otro a poca distancia? Buena, aquí está una razón…Existe mucha demanda en el Canal de Panamá, al punto que el average de tránsito de una punta a la otra, es de 12 días. Otra de las razones, es que los barcos más grandes que pueden transitar en Panamá son los llamados PANAMAX. Cada uno de estos barcos puede llevar 4,500 contenedores. Pero existen nuevos barcos llamados POST – PANAMAX, de ellos, habrá un Modelo llamado TRIPLE-E, que pueden llevar más de 18 mil contenedores, o sea, 4 veces más que los barcos de PANAMAX. Geographically, this canal makes perfect sense. There are only 12 miles from the Pacific towards the Lake of Nicaragua, and then from there it connects to the Atlantic. But it remains unclear if that is the route the canal would take.For Nicaragua, this mega-project makes a lot of sense. Construction would double the gross domestic product (GDP) per head in the nation, which last year was 3,300 dollars. But why build a Canal, when there is already another so nearby? Well, here is a reason…There is a lot of demand for the Panama Canal, to the point that the average transit time from one end to the other is 12 days. Another reason, is that the largest ships that can pass in Panama are the so-called PANAMAX. Each of these boats can carry 4,500 containers*. However, there are newer, POST-PANAMAX, ships, among which will be a TRIPLE-E model capable of carrying more than 18 thousand containers, or 4 times more than PANAMAX vessels. The Nicaraguan government wishes to secure a GDP increase of 15% by 2015 and even double the economy in the year 2018. It will not be until next year, 2014, when the feasibility studies and environmental impact report are conducted, that the viability of this mega-project can be properly assessed. *Note: The Panama Canal is currently undergoing an expansion project to allow much bigger vessels, of the “New-Panamax” size, to transit, but this will still leave some vessels unable to pass.